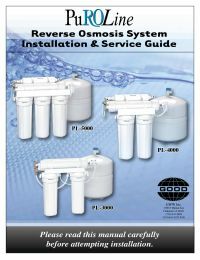 Our environmentally friendly PuROLine Reverse Osmosis System features the non-electric, hydraulically driven Permeate Pump for superior water quality, higher delivery flow rates/presssure and 80% waste water savings over conventional RO systems. The positive displacement, reciprocating, single action diaphragm pump operates as an energy recovery device - resulting in dramatic efficiency improvements to RO. The Pump is powered by hydraulic energy of the brine water (rinse water) normally lost to the drain to force additional purified water into the pressurized RO Storage Tank. This increased pressure allows the RO membrane to perform as though it was filling an atmospheric tank. The Permeate Pump maximizes the holding capacity and delivery flow rates of the RO tank by allowing the tank to fill up to 98 % of the incoming water pressure vs 65% of conventional RO systems. No need for a 3rd prefilter (ie "5 stage") due to water savings realized from the permeate pump! Permeate Pump with Hi Cut-Off Automatic Shut Off Valve (90%) . Ideal for low pressure applications! Increases membrane life by lowering "TDS creep"
Maximizes holding capacity of storage tank.